The Perry School Board convened Monday evening for their July regular session. The meeting started with an update from EMC Insurance about the continuation of the District’s group insurance policy. The school will pay $248,000 for the renewal, which reflected a 2% decrease from last year’s premium. Following that, Industrial Technology Teacher Curt Cornelius gave a report on the high school’s SkillsUSA trip to the National Conference in Louisville, Kentucky. In general business, the Board approved four change orders for the Dewey Field renovation project: two related to fences and gates in front of the south bleachers; one eliminated the need to remove the existing bleacher footing, which will save money on the project; and the last related to patching portions of 18th Street. 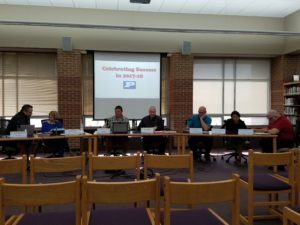 The Board also approved several other action items, including: changes to all of the school handbooks and adding an elementary student laptop handbook; assigning Linda Andorf as the District’s delegate to vote on a vacancy on the Heartland Area Education Agency; and revisions to Board policies. The Board also approved several yearly appointments, including: Kent Bultman as Board Secretary and Treasurer; Raccoon Valley Bank as the primary bank depository, along with U.S. Bank, Wells Fargo, and ISJIT as supplemental depositories; Mel Raskie and Clark Wicks as level I student abuse by school employee investigators and Police Chief Eric Vaughn as level II; Angelica Cardenas-Diaz as District equity and equal opportunity and Affirmative Action officer, as well as the District’s homeless coordinator; Kevin Vidergar as Section 504 coordinator; and Laura Skeel as Americans with Disabilities Act coordinator. To learn more about the Perry School Board meeting, listen to today’s Perry Fareway Let’s Talk Dallas County program on air and online.